Eccentric turning is something that more people are tackling, but many are baulking at the price of some items available to enable such projects to be undertaken. This new Wobble Chuck from Robert Sorby may well provide the solution we are looking for. It is designed around a body that is in two parts which is held in a chuck. The top part sports a screw (a very long one at that) and three holes, which enable you to hold work by three screws or a single one, as the project requires. 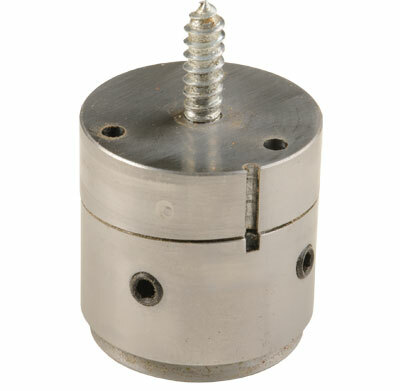 There is a grub screw which allows the central screw to be locked in position, and the lower body has two grub screws to lock the top part in a user-chosen position. The meeting faces between the two bodies are canted to allow the top to be rotated, thereby creating a degree of offset/eccentricity to the work. There is a centralising line to show when the two parts are dead in line, but other than that, the offset chosen is trial and error. I have to say it is quite liberating not to be hide-bound by manufacturer presets and constraints. This is free-form eccentric turning at its best - user driven and applied so everything is unique. The Wobble Chuck can be held in 50mm (2in) jaws (internal form) of various makes and is robustly made from steel throughout, as well as being capable of a lot of rough and tumble (heavy handed treatment). If you are looking to replicate cut positions you will need to mark (a permanent marker is ideal) on the body the position and number sequence as necessary. This can be removed when you have reached the final number of projects and cut stages required. I like the freedom this product gives. Yes, it makes you think about what you do and how to get to the end result - a bit of juggling of position is also possible. Within two minutes of starting I was able to create an offset finial of sorts - longer experimentation has yielded a greater understanding of what can be done. 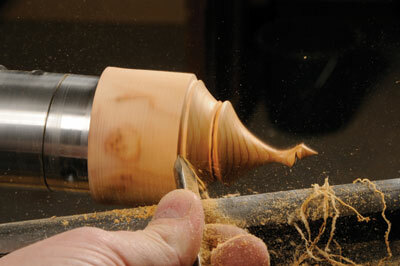 This is no different to using a gouge or any other tool - more practise equals more consistent results. I will say that I cut down the wood screw a bit as I found it too long for what I was doing, but a better option is to have a range of screws that can be locked into the body to suit different sized projects. It is a fun product with a lot of potential, limited only by yourselves. "It is a fun product with a lot of potential"